CENTURY CITY, Calif.—It's the start of the second day of recording music for Dawn of the Planet of the Apes on 20th Century-Fox's cavernous Newman Scoring Stage, and there's a commotion in the back of the room: two additional players have unexpectedly joined the percussion section. 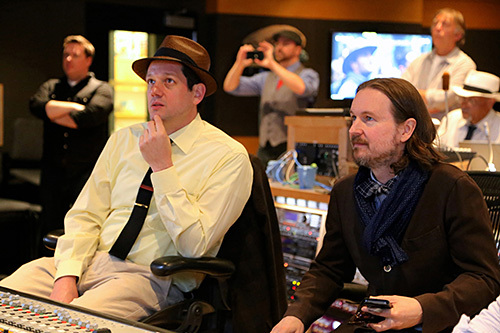 Michael Giacchino and Matt Reeves watch a playback during a recording session for Dawn of the Planet of the Apes. 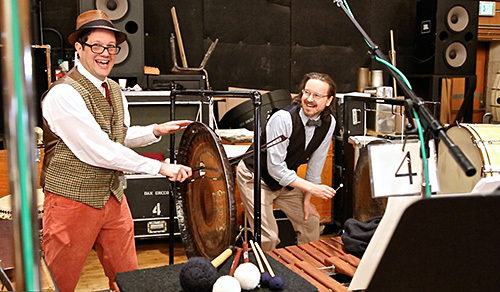 Composer Michael Giacchino, looking very 1940s in a vest, tie and brown fedora; and director Matt Reeves, equally classy in vest and bow tie, are preparing to play bowed cymbal and rubbed SuperBall on gong, respectively, adding to the catalog of weird sounds and unsettling noises already present in the score. For a video of the moment, click here. From the podium, conductor Tim Simonec asks, "What instrument are you playing?" to which Giacchino good-naturedly responds, "Don't you worry about it," to gales of laughter from the professional musicians. Two takes later, cue 4M21 is perfectly recorded and both composer and director rush back to the booth to listen to a playback. The lighthearted atmosphere on a Hollywood scoring session is unusual these days, especially considering the pressures associated with a $120-million summer tentpole, part of a very successful studio franchise. But this is the third film that Giacchino and Reeves have done together (the 2008 monster movie Cloverfield and 2010's vampire film Let Me In preceded Dawn), and they are not just professional collaborators but close friends. But the music-making itself is serious. It will take six days to record 115 minutes of music with an orchestra of 89 and choir of 70, including some of the most sophisticated sounds yet created by the composer of Up (which won an Oscar) and Lost (which won an Emmy). Still, Giacchino is not above showing up in an ape mask to lighten the mood, just as Jerry Goldsmith had famously done when recording the original Planet of the Apes score in 1968. 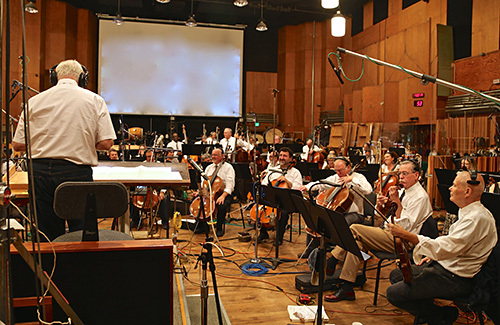 Conductor Tim Simonec instructs the orchestra during an Apes session on the Newman Scoring Stage at 20th Century Fox. One of Giacchino's eight percussionists was another link to the Goldsmith classic: 81-year-old Emil Richards, who played on the 1968 original (and at least three other Apes films including the 2001 remake). Like his work with Goldsmith, Richards brought another new sound to this film: banging on metal molds for terra cotta flower pots. Also in the expansive percussion section: Taiko drums, anklungs, log drums, puili sticks, marimbas, congas and many other instruments. But that's not all. Giacchino takes pride in showing how he has tinkered with Alfred and Lionel Newman's vintage Fox piano, placing screws and other items between the strings: what is known as prepared piano, "which gives you this strange, otherworldly feel," the composer explains. "That was important to illustrate the primal side of these beings, where they came from. It was a chance to do something that felt either alien or uncomfortable. There are many places in this film where we wanted you to feel very uncomfortable. A good way to do that is to use the instruments of the orchestra in ways they're not normally used." Another aspect of the avant-garde nature of some of Giacchino's Apes score was heard a week later, when choral contractor Bobbi Page assembled 40 women and 30 men to perform eerie choral passages reminiscent of Gyorgi Ligeti's Requiem music heard most famously in 2001: A Space Odyssey, some of them wordless, others loosely based on Latin phrases. Mainly, however, Giacchino points out, his job on Dawn of the Planet of the Apes was to enhance the emotional aspects of the story. "I told Matt, right off the bat, 'We have to care about all of these characters.' One of the things that the earlier Apes films lacked was the idea of emotion. They were heavy on sci-fi and weirdness but emotion was not really explored. When I first saw this film, I realized there are no bad guys. There are characters who believe different things. Both sides are trying to convince the other that what they believe is right, and they have valid reasons for believing that. Matt has created something that is incredibly complex in all the right ways." Giacchino and Reeves cut up in the percussion section. The two actually played percussion on a cue. Giacchino's score deepens the already powerful story with music that helps us sympathize with both the evolving apes and the desperate humans who find themselves at odds in the overgrown region near a future San Francisco. Reeves expands on that idea during an orchestra break at Fox: "The movie needed to be epic and expansive but, at its heart, it also needed to be incredibly emotional. Michael is so critical for realizing this. When he played me the first piece, the Noble Apes theme, I was so moved. It immediately felt to me like one of those classic themes, like John Barry's Out of Africa or Dances With Wolves. It wasn't just that the movie needs to have scale and scope. It's the level of intimacy, the gentleness of emotion, what's going on under everything. This very epic theme is incredibly tender. That mixture is very Michael. He has such sensitivity." Giacchino saw the film in an early version more than a year ago and responded with a 10-minute "suite" of themes he thought might work for the film. Then, after conversations with Reeves, he "roughed out" the entire score in 15 days (before he flew to London last summer to record his score for Jupiter Ascending, to be released next year). He also conceived a different arrangement for the orchestra during recording, moving two sections of violins opposite each other, placing two harps on opposite sides of the room, the percussion in the rear, all designed to "surround" the moviegoer with the orchestra, "almost as if you were in the center of a forest and all of those sounds happen around you." Giacchino, who recently returned from sold-out live-with-film London concerts of his Star Trek and Star Trek Into Darkness scores, has three more films on his schedule for the next year: Tomorrowland, a Disney film for his longtime friend Brad Bird (Ratatouille); Inside Out, a Pixar film for his Up collaborator Pete Docter; and Jurassic World, latest in the dinosaur series from Amblin/Universal. 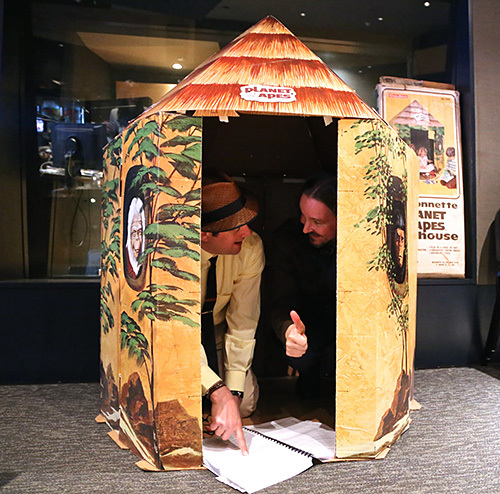 Giacchino and Reeves jokingly confer on a cue inside a vintage 1975 Coleco Planet of the Apes Playhouse.